Looking back 30 years to when England at last made light work of a World Cup qualifying campaign, booking their place in Mexico before the final match.. When the 1986 World Cup qualifying draw was made in December 1983, Bobby Robson was feeling the pressure. England had failed to make it to Euro ’84 and he desperately needed good results to win over the press and public. The draw was relatively kind, with England grouped with Northern Ireland, Romania (or Rumania as they were usually known at the time), Finland and Turkey. 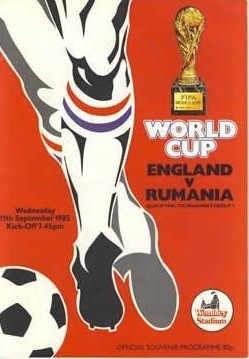 It basically looked a three-horse race for the two spots between England, the Northern Irish (who had got out of the group stage at World Cup ’82 and almost pipped West Germany to a spot at Euro ’84) and Romania (who qualified for the Euro finals and boasted the emerging talent of teenager Gheorghe Hagi in their ranks). Being in a five-team group meant England only had to finish second to qualify automatically, but on the flipside this meant there was one extra away game for the English hooligans to potentially bring further shame on the nation. Robson was certainly viewing the draw with the yobs in mind, revealing his relief at not drawing Luxembourg just weeks after trouble from England’s followers at the final match of the Euro ’84 qualifiers. “I was hoping we didn’t draw them again. I don’t think they deserved us,” he said. In the 10 months between the draw and England’s first qualifier, Robson went through the emotions. Defeats by France, Wales and USSR piled the pressure on (the latter defeat seeing him jeered by a section of the Wembley crowd) before the turning point of a famous 2-0 win away to Brazil. There seemed to be a new belief about England as 1984-85 rolled around, although it took a brilliant Bryan Robson volley to settle a drab friendly with East Germany. Times were changing for England and having been European under-21s champions in both 1982 and 1984, there were reasons to be optimistic about the future. Players such as John Barnes and Mark Hateley were bursting onto the scene with good effect and established internationals like Robson, Terry Butcher, Glenn Hoddle and Kenny Sansom were still only in their mid-20s. Most of the old guard inherited by Bobby Robson in 1982 were no longer on the scene. 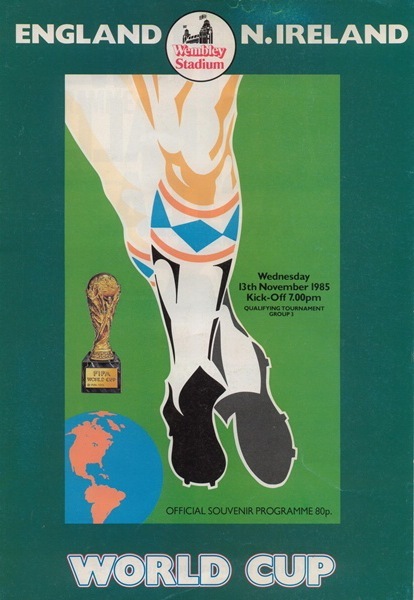 By the time England played their first qualifier in October 1984, they had been handed a bonus as Northern Ireland (to Finland) and Romania (to Northern Ireland) had already suffered defeats. England had suffered rude awakenings by Scandinavian sides Norway and Denmark in recent years but the visit of Finland proved straightforward with a 5-0 win in which Kenny Sansom scored his only international goal. Things got even better a month later, when England won 8-0 away to Turkey to leave them with maximum points and a goal difference of +13 from just two games. Bryan Robson scored a hat-trick, while namesake Bobby was acting the perfectionist and believing “we’ve left them off the hook” in only winning 8-0! A difficult year had turned into a good one for England. 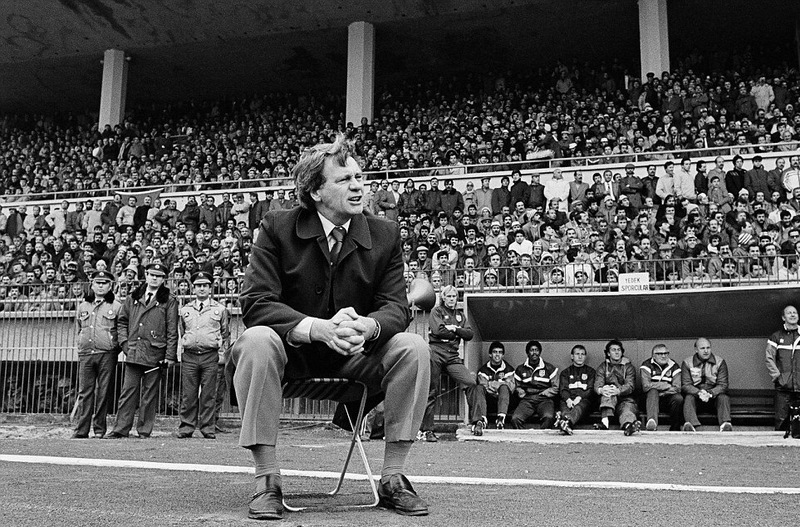 Bobby Robson gets a front row seat for England’s game in Turkey. 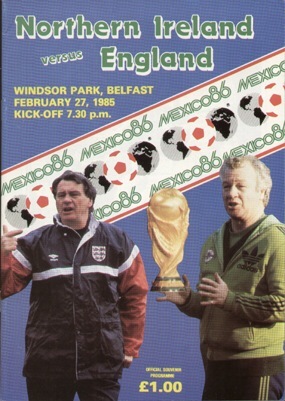 In February 1985 England made the short trip to Belfast to face Northern Ireland at Windsor Park. Billy Bingham’s side had won the last Home International Championship the previous year and there was understandable resentment at England’s withdrawal from the competition (effectively killing it off). England did not play well in this qualifier, coming under the cosh as the home side threatened. But it seemed a measure of how Robson’s luck seemed to be turning that they survived unscathed and snatched a late winner through AC Milan’s Mark Hateley. The following month brought a friendly win over the Republic of Ireland, most notable for bringing Gary Lineker’s first England goal and Chris Waddle’s international debut. In May England faced two away qualifiers, the first being a tough looking trip to Romania where they had been beaten in the 1982 World Cup qualifiers. This time around they claimed a 0-0 draw that left them three points clear at the top of the group and having yet to concede. Three weeks later they travelled to Finland, for a match oddly scheduled to be played the day before an FA Cup Final replay if one was needed (Steve Hodge recalled in his autobiography spending cup final afternoon desperately hoping for a draw between Everton and Manchester United so he could get a call-up). It wasn’t, but England looked tired and it took a goal from Hateley to salvage a 1-1 draw that kept the Finns in surprise contention to qualify. The coming months would be completely overshadowed by matters off the field, as English football was plunged into an even deeper crisis. The horrific events at Heysel, Bradford and Birmingham made May 1985 English football’s nadir and those at the top needed to pick up the pieces. English club were banned from Europe, crowds were about to plummet even further and a TV rights row ended in deadlock as the Football League would be off the screens for the remainder of 1985. It was a bleak time. The national team remained on TV, albeit only in highlights form for the remaining three qualifiers all at Wembley. Returning from a trip to Mexico (where they met Italy just eight days after the horrors of Heysel) and USA with Gary Lineker and newcomer Kerry Dixon on the goal trail, things boded well for England as they looked to put a smile on the faces of the nation’s football fans. In September, England were held to a 1-1 draw by Romania at Wembley, but the point meant they were almost there. There would be controversy over Rodion Camataru appearing to use his hand in the build-up to the Romanian equaliser, acting as an ominous precursor of what lay futher ahead in England’s World Cup ’86 campaign. As the Three Lions failed to find a winner, BBC commentator Barry Davies started drawing comparisons with the infamous Poland match in 1973, but he was being melodramatic. England were almost there and it looked like Romania would join them. The following month England could celebrate as Northern Ireland won away to Romania and then Lineker scored a hat-trick against Turkey in a 5-0 win. After coming perilously close to missing out on World Cup ’82 and then failing to make it to Euro ’84, it was a welcome relief for England to seal qualification early and all roads now led to Mexico. To cap a good week for England, they were given the green light after a UEFA vote to enter Euro ’88 after it looked like the yobs could see the national team join English club sides in being European outcasts. “I am not going to say this is the greatest achievement of my career or the proudest night of my life. I am just very pleased that we are there” – Bobby Robson after the 5-0 win against Turkey, October 1985. The final round of qualification for England would unusually see much of the focus of the British media be on the opposition. Northern Ireland needed a draw at Wembley to join England at the finals, which created an awkward situation. Coming so soon after the West Germany v Austria controversy at World Cup ’82, it seemed odd this fixture had been agreed for the final round of matches. Such a scenario like this one was always possible and it would have been far better to switch the previous round of matches with these (Romania were away at Turkey). England would have to go out and seek to win it to show they were above reproach, even if as Bobby Robson conceded they would probably then get criticism from some quarters for stopping a fellow United Kingdom side making it. It was a no-win scenario. The Romanians won in Turkey so it would boil down to this one, and it was left to 40-year-old goalkeeper Pat Jennings to roll back the years and keep England out. The visitors defended deep and endured a long night, but there was to be no winner coming for England. Jennings rightly took the plaudits after the 0-0 draw, which suited both as England qualified as unbeaten group winners and Northern Ireland made their third finals. For the second successive World Cup qualifying programme, Romanian dreams had ended with a match at Wembley they hadn’t even played in. As reporter John Wragg summed it up in the Daily Express: “If Rumania have any argument with this result, point them in the direction of big Pat Jennings.” It was a heartwarming story to see the veteran goalkeeper steer his team to the World Cup finals while no longer playing first-team club football. As for England, they had finished top of the group with four wins and four draws. It hadn’t been a particularly vintage qualifying campaign – bar the 8-0 demlition of Turkey – but England had been in control and qualified without the usual final game anxiety. For Bobby Robson, things were now looking up after the torment of the Euro ’84 qualifying campaign. Next Next post: What if… West Germany hadn’t equalised in 1966?